Chances are, your mother’s never heard of Valiant Comics, nor did you cart around a lunch box adorned with one of its characters in your adolescence. In the grand history of superhero comics, Valiant is still in its relative infancy, founded in 1989 by former Marvel editor-in-chief Jim Shooter and seminal Iron Man scribe Bob Layton. But in the hyper-competitive ecosystem of superhero comics, the resilience shown by these characters and properties throughout their turbulent history belies a survivalism that few other fictional universes have sustained. Reignited in 2012 under new ownership after game company Acclaim dropped it in 2004, the Valiant universe reintroduced such characters as X-O Manowar, Shadowman, Quantum & Woody and Archer & Armstrong under the stewardship of caring, talented creators. Matt Kindt is one such creator, whose intricate plotting and deft characterization have graced titles from Justice League of America to Marvel Knights: Spider-Man. But despite access to these massive properties (and his brilliant creator-owned Mind MGMT), Kindt has assumed the role as a chief engineer of all things Valiant, currently writing Unity and Rai, with the future titles Divinity and Ninjak slated for Winter and Spring, respectively. His greatest contribution to the imprint, though, may be The Valiant, a 4-issue miniseries co-written with Jeff Lemire that straddles the epic and intimate with grace. 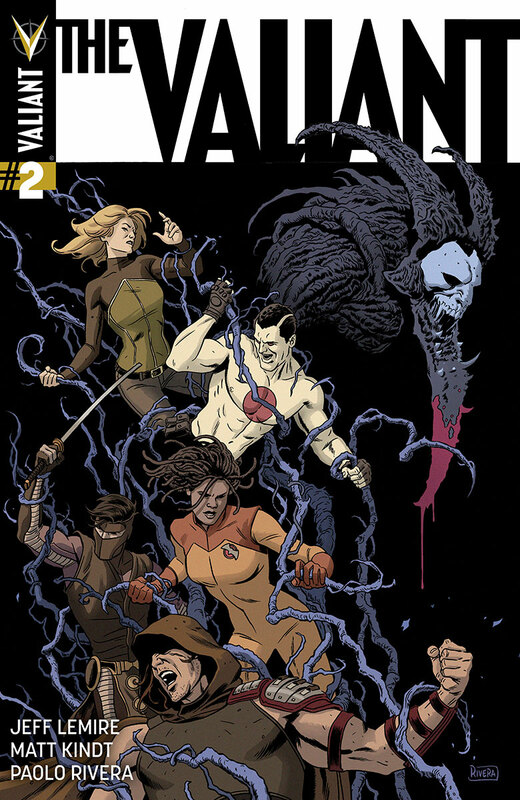 Constructed around an ageless conflict between the metaphysical agent of entropy and an immortal warrior, the first issue seamlessly provides a crash course through the Valiant universe with adventure, intrigue and a surprisingly amount of humor. 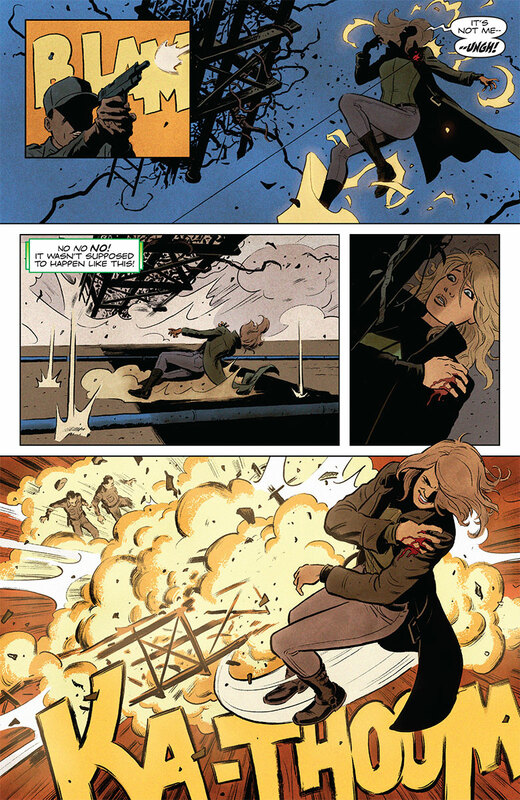 Kindt and Lemire expertly juggle a parade of characters and genres, crafting a wind-resistant event book without the marketing hyperbole or tie-ins to dilute its message. Illustrated with classic finesse by Paolo Rivera, The Valiant is a near-perfect introduction to an ascending cosmos, and more importantly, a damn fine comic. Paste chatted with the affable Kindt over the phone to discuss the appeal of working with newer publishers, how to strategize agile event books, and caffeine-fueled brainstorming sessions. Paste: It sounds like you have quite the workload. Paste: You write for a range of publishers with a strong footprint in DC and Marvel, and now you’re a linchpin in this reignited Valiant Universe with your ongoing titles, as well as this miniseries. What about the Valiant Universe appealed to you to take such a prominent role in it? Kindt: The thing is, I grew up with Marvel and DC, so there’s always a nostalgia factor there for me, which is why I enjoy doing the work I do for them. Over the past couple years, I’ve been in a pretty lucky position where I’ve been offered things, and I can take or leave things that interest me or don’t. I came to the Valiant universe later, when I was older and sick of superhero comics, but it appealed to me then and it appeals to me now for the same reason. The difference between their universe and all the other ones, to me, is the realism of it. I think Jim Shooter said it when he started it — it’s our world, but they rotated it ten degrees to the weird or fantastical. That’s kind of what I like, because I feel that’s how I approach my own work in the creator-owned stuff I do. I do the same thing; I take a fantastical idea and just sort of imagine what that would be like if it happened for real, which is kind of what the Valiant universe is to me. It’s some crazy alien armor or a guy who can live forever, but what that’s like in our world, rather than a bunch of crazy things happening all the time. I think that’s what appeals to the grown-up superhero comic book reader. Paste: When you look at newer superhero comic imprints, they’ve historically struggled to stay in such a competitive market. Do you think the above reasons are why Valiant has popped up as a challenger from time to time? Kindt: You know, I think it is. It sort of gets lost sometimes, because of all the noise in the other stuff that’s happening, and it’s a shame. Looking back to the nineties, I didn’t know who these characters were and I was willing to take a leap. I hadn’t read these stories before — these things hadn’t happened a thousand times before. It’s a world I can relate to and recognize. Then when I came back to Valiant a couple years ago when they relaunched, I came back as a fan. My brother called me and said, ‘hey Valiant’s back!’ I started picking up a few issues here and there, and I was impressed again. It’s just something that’s been consistent with the line since it started. And it’s like, why release a superhero book in a market that’s completely flooded with them? The only reason we do it is we can have something that’s super smart and different and unique. 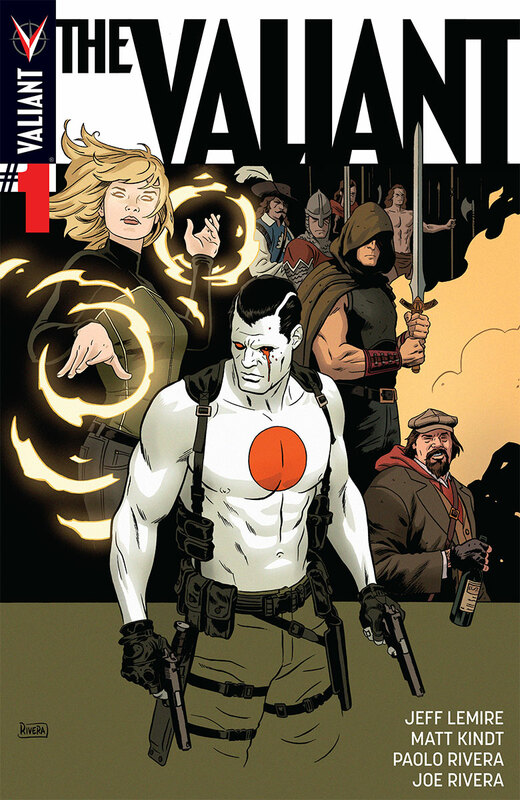 Paste: How would you describe your new miniseries, The Valiant? Kindt: On the surface, it’s the big event book that’s only four issues. It’s not very long and it doesn’t cross over with every other title in the line. But it’s a story that encompasses every character. It’s a good way for readers who have never tried a Valiant book to jump in and get a taste of everything, and see how the universe works on a superficial level. But then on another level, the main story is between this character Bloodshot and Geomancer, who’s the protector of the earth. The main story is their story, and how they relate to each other. This (Bloodshot’s) a cold-blooded killer and (Geomancer’s) like a hippy savior of earth. We’re putting them together and seeing how they react. It’s the heart of the story. And then built around it is this bigger story of this immortal enemy who’s been around forever. I’m writing it with Jeff Lemire, and we’re writing it conscious of every crossover that’s ever happened, and every big event book that’s ever happened. We didn’t really want to write that. It’s been done before. We wanted to write something that sort of looks like that and sort of acts like that, but there’s a real beating heart and a small story at the center of it all. It just has the trappings of this big event. That’s the fun and the challenge of it. And then Paolo Rivera drawing it really helped me, because it looks amazing. Paste: The beating heart would be Kay, the 20-something publicist who’s transformed into earth’s protector? Kindt: Definitely. It’s her, and even Bloodshot. He’s a character who’s hard to pin down and dislikable in a lot of ways, because of the things he’s done. Contrasting them by putting them together is what the story is all about. Paste: I thought it was hilarious turning the corporate publicist into a role that would be completely contrary to those incentives. Was that done with humorous intent? Kindt: She was around in the ‘90s. That was something that was already in place where she was a publicist. I don’t think I made that up, but that was something that was just too funny to not bring to light. It’s a fun irony. 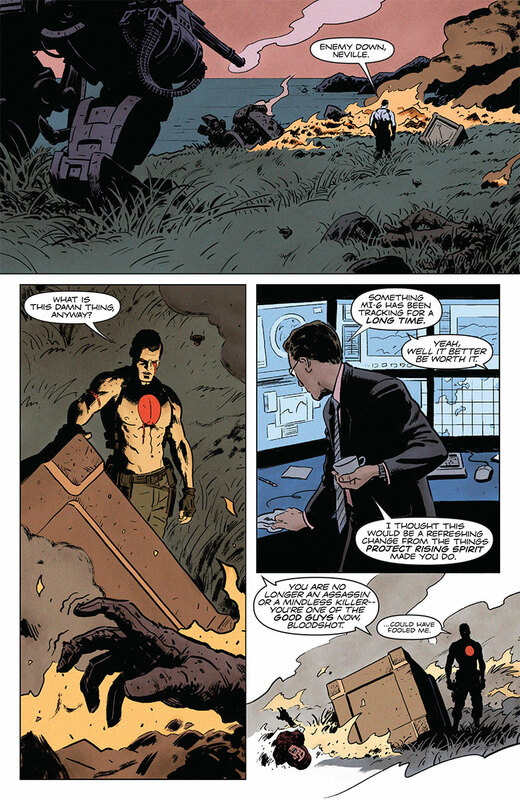 [The character was created by Fred Van Lente in Archer & Armstrong]. Paste: This first issue seemed like a huge balancing act between telling a compelling story while also introducing a slew of established characters, without relying on dry exposition. 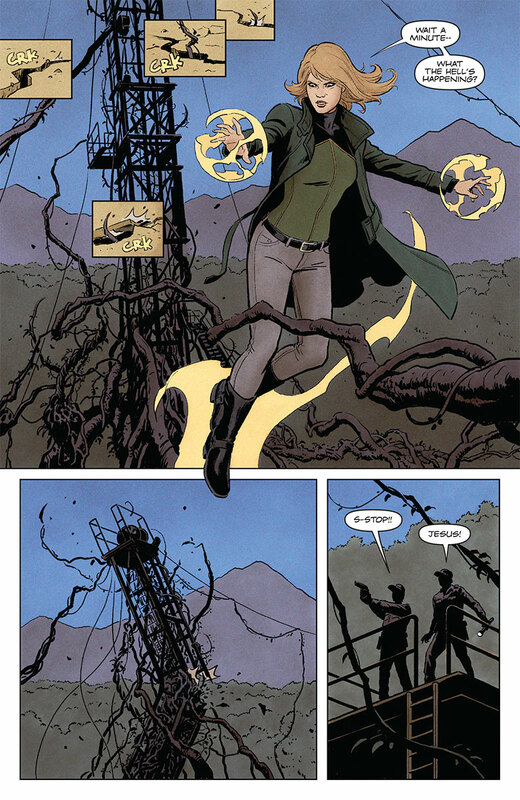 How did you and Lemire tackle that tightrope? Kindt: It was an interesting challenge; neither one of us has written a book like that before. We’re trying to do a lot with very little. It sounds super pretentious and I hate saying it, but comic books can often be like poetry. You’re evoking a lot with very few words. And I think the same is true with this series. I think we’re showing this giant universe and a lot of characters, but in a very streamlined way. We’re just evoking the idea of these characters and what they’re about. My favorite page in this issue is just Geomancer talking for nine pages in a row. I like throwing that into this big event book with giant fights, and then we get a page of her talking, giving her a voice when she didn’t really have one before. And we’re having a lot of fun. It’s not like it’s hard to do — Jeff and I work really well together. We’ll break down an issue and decide who writes what scene. When it came all together, it seems to be working. Paste: I’m curious about the initial coffee session where you two charted out the entire miniseries after a convention. Kindt: We were at Emerald City last year and one night after the show we talked about doing something together. For the past few years we toyed with different ideas, and I was having a lot of fun with Valiant and he wanted to do something. I can’t remember the name of the restaurant — we got dessert and drank a ton of coffee and spent a few hours. We got our laptops out, apologized to the waitress and just brainstormed tons of ideas and wrote a bunch of things down. We came away from that night with a pretty rough outline of the entire thing, which changed the more we thought about it. But the bones of it all were done in that one night. You’re usually tired and crash at the hotel; it was nice to actually get something down. We tipped the waitress really well because we were there a long time. Paste: Though it’s self-contained, The Valiant feels like it will have major ramifications for the company line. How does the miniseries fit into the entire mythos? Kindt: I think other than an introduction and an overview of the whole universe, there will be a few characters who come out of this and a few characters who are changed forever. It seems ridiculous to say in comic books, but some things will definitely be different when this is done. Not in the way that’s like, ‘buy this because somebody’s going to die and nothing will be the same!’ but I will say that some of that stuff does happen. To me, it’s not about the thing that happens — it’s how it happens and how we tell it. Hopefully it’s just a good story. It does have a cause and effect, and it will effect everything going forward. That’s kind of what I like about the universe, too: it’s something that’s more malleable. These are characters that can die and things can change. That’s kind of the fun of it — it’s dictated by the story, not the fact that a character has to be in the same spot he or she was when he or she was picked up. I’m being super vague on purpose because I don’t want to spoil anything.